The Trump administration’s decision to keep many U.S. national parks open during the current federal government shutdown, with few or no staff, spotlights how popular and how vulnerable these unique places are. Climate change will force wild species in all national parks to adapt, often by migrating. The problem is that U.S. policies – especially under the Trump administration – are fragmenting connections between parks and other public lands that give natural systems better odds for survival. External threats to national parks aren’t new. Politicians started trying to protect the Grand Canyon from private interests in the 1880s. Finally, in 1908, President Theodore Roosevelt used his power under the Antiquities Act to designate the canyon as a national monument. During a visit to the canyon, Roosevelt told onlookers, “I hope that you will not … mar the wonderful grandeur, the sublimity, the loneliness and beauty of the Canyon. Leave it as it is. You can not improve on it.” A decade later, President Woodrow Wilson signed the bill that created Grand Canyon National Park on Feb. 26, 1919. Part of the National Park Service’s mission is to conserve wild species and natural systems in the parks “by such means as will leave them unimpaired for the enjoyment of future generations.” Climate change makes this an epic challenge. For example, Grand Canyon National Park’s climate change action plan warns of more frequent droughts, habitat fragmentation, more frequent and intense wildfires and floods, and shrinking waterflows in the Colorado River. And, of course, the gathering heat. 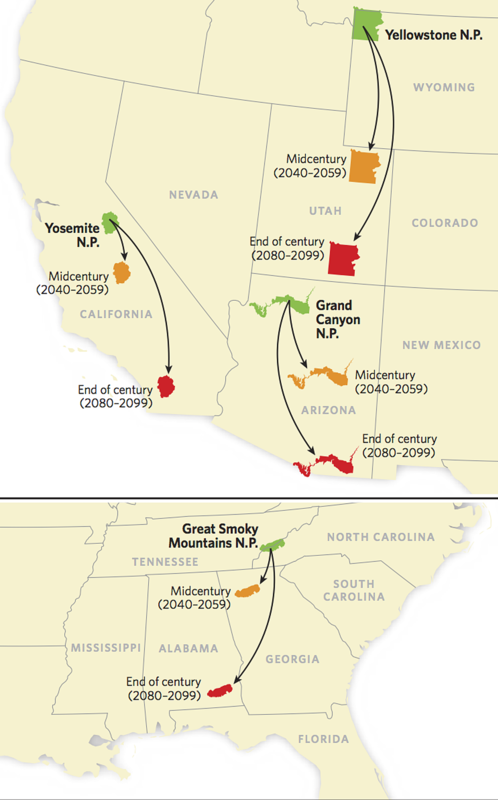 In effect, many national parks’ climates will move two or three hundred miles south during this century. By 2100, if global greenhouse gas emissions continue to rise, Grand Canyon will be as hot as the climate now is along the Mexican border. The climate of Great Smoky Mountains National Park, the most popular in the system, will slide nearly to Florida. As soon as two decades from now, according to the latest U.S. national climate assessment, the Grand Canyon region and its wild species could endure 40 to 50 more days with temperatures over 90 degrees yearly. Similar changes are occurring throughout the park system. Glaciers are disappearing from Glacier National Park in Montana. Giant sequoia trees in Sequoia and Kings Canyon National Parks in California are threatened by heat, fire and insects. Rising seas are starting to inundate dozens of parks along coastlines, from Florida’s Dry Tortugas to Alaska’s Bering Land Bridge. As climate zones shift, many plants and animals will need to migrate into or out of protected natural areas to stay within temperature and moisture ranges where they have evolved over thousands of years. Scientists are outlining plans to ensure futures for at least some of these species by making it easier for them to move to different habitats. But studies on “climate connectivity” warn that if public lands around national parks are used for drilling, mining, logging and commercial development, they won’t function as survival paths for wild species. This research signals that if the goal is to guard the endurance of wild species for future generations, Congress and federal agencies will need to find new ways of managing the nation’s million square miles of federal public lands. National parks will need to depend on healthy adjacent national forests, wildlife refuges, monuments and rangelands, maintained in their natural state. However, the Trump administration is opening public lands in pursuit of “energy dominance.” The Interior Department has removed millions of acres from national monuments and opened them for uses such as logging and mining. Oil and gas leasing on public lands has tripled since President Trump assumed office. In contrast, studies by federal agencies and private researchers show that even in raw economic terms, healthy and protected landscapes are worth tens of billions of dollars to their owners – the American public – each year. Meanwhile, climate change ratchets up. Preserving the nature of U.S. national parks will require connecting and protecting all of America’s public lands. Stephen Nash is a visiting senior research scholar at the University of Richmond. This article originally appeared online at The Conversation.